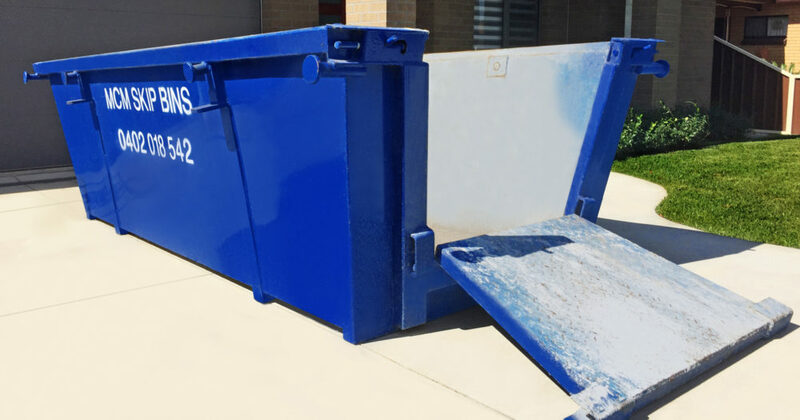 Are you looking for fast and easy Cronulla skip bin hire? Your local supplier of skip bins since 2003, MCM Skip Bins uses its years of experience to make getting rid of your rubbish efficient and effective and all at a great price. We don’t want you to pay for what you do not need. We know all the right questions to ask to help you sort our what size bin you will need, timing for your job and placement of the skip bin for easy loading. You might be a unit or house owner carrying out renovations, moving or landscaping. You may be cleaning out a property for a relative or looking after a deceased estate. Our range of marrell and hook lift bins with rear doors come in 3, 4, 6 and 8 cubic metres. This range of bin sizes caters for all needs and budgets. Builders, shop fitters and other trades need not only the best prices but reliable service with guaranteed drop off and pick up times. You can count on our clear communication and understanding of how job sites work, access issues and keeping other trades and your customer happy too. Cronulla is a famous Sydney beachside suburb about 26km south of the CBD. Breathtaking surf beaches and swimming spots wrap around one side of the peninsular. Patrolled Beaches at Wanda, Elouera, North and South Cronulla see swimmers, surfers, boarders and the like all year round. On the other side of the peninsular off South Cronulla is the opening to the pristine Port Hacking River, the boating and fishing mecca of the south. Gunnamatta Bay has a marina and sailing club and netted areas for swimming and diving. MCM Skip Bins is a proud partner of the residents, builders and trades that work hard to transform the ever-changing streets of this thriving suburb. For over 15 years we have been providing top end service at great prices for skip bin hire on the Cronulla peninsular in homes, units and shops and are now a proud partner of the new Greenhills beach development. The Esplanade walkway of Cronulla and South Cronulla showcases the latest of architecture and design for both apartment living and multistorey homes. These glamorous homes are not only surrounded by water but amazing parkland like Shelly Park, Oak Park and Gunnamatta Park where modern playgrounds and picnic nooks look over inviting swimming spots. Almost as well know for its beaches is Cronulla’s fashionable and refined choices of restaurants, bars and eateries. Cronulla Mall, Gerrale St, Surf Rd and more offer discerning diners modern choices of nourishing takeaway, urban dining and gourmet treats. A vibrant social scene is ever present at Cronulla RSL and Zinc Bar. Dance the night away at JD’s. Cronulla-Sutherland Sharks Rugby League team is passionately supported by this community. Many children follow in the footstep of the players joining De La Salle Junior Rugby League or Cronulla Caringbah Junior Rugby League Club. Soccer or Cricket at the Cronulla Seagulls and netball of course is Cronulla Shark Netball Club. All of the surf clubs in Cronulla run nippers in the summer and surf awareness clinics through school holidays. Our trucks are always buzzing around the streets of Cronulla whisking away unwanted rubbish and waste from renovations, movers and the like. We enjoy our Cronulla skip bin hire customers here and thank you for your loyalty over many years.